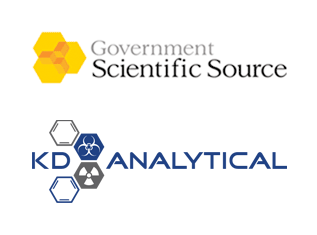 KD Analytical (KDA) announced today that it has been selected, in partnership with prime contractor Government Scientific Source (GSS), to support the General Services Administration’s multi-million dollar indefinite delivery, indefinite quantity (IDIQ) contract to provide chemical, biological, radiological, nuclear and explosive (CBRNe) detection and protection equipment and sustainment for the Joint Product Manager Consequence Management (JPdM-CM) under Joint Program Executive Office, Chemical Biological Defense (JPEO-CBD). The contract is expected to have a maximum combined IDIQ ceiling value of $500 million and a five-year period of performance including option years. KD Analytical and Government Scientific Source will be eligible to compete for task orders until the shared ceiling is reached. Under the contract, KD Analytical will provide maintenance, technical support, and training for commercial off-the-shelf (COTS) CBRNe detection and protection tasks in support of the JPdM-CM mission for non-medical CBRNe equipment. The JPdM CM is one of several sub-organizations under JPEO-CBD tasked to provide COTS CBRNe equipment that directly detects, identifies, monitors, and protects individuals from the effects of CBRNe contamination and enhances their capability to assess, detect, identify and mitigate at a CBRNe or WMD incident. The purpose of this IDIQ contract is to service the requirements for the JPEO-CBD office for the purchase of CBRNe equipment. Government Scientific Source is the leading dedicated supplier of analytical chemistry equipment and consumables to federal, state, and municipal government laboratories. GSS offers the widest selection of products and the most procurement channel options available in the industry. GSS maintains multiple GSA federal supply schedules, DAPA contracts, and blanket purchase agreements to facilitate procurement administration and compliance. KD Analytical Consulting, Inc. is a CBRNe (Chemical, Biological, Radiological, Nuclear and Explosive) instrument and operator sustainment company that serves the homeland defense, first-responder and environmental monitoring communities. The Lexington, Kentucky based company provides subject-matter expert technical support, instrument maintenance and training, delivered 24/7 via ReadiTrak™, a cloud-based maintenance management application, and backed by an extensive quality program, ISO 9001:2008 compliance and certification by multiple original equipment manufacturers.